Linux Mint has been around since 2006. Linux Mint is a full multimedia supported desktop operating system very similar to Ubuntu. Linux Mint is the fourth most used home operating system behind Microsoft Windows, Mac OS, and Ubuntu. Linux Mint is based on Debian and Ubuntu. This guide will show you how to install Linux Mint 14 “Nadia” as a dual-boot with Windows. This guide is for the MATE edition. The first step you need to do to complete the Linux Mint is to go to the Linux Mint website and download the ISO image. The link to the download page can be found here: http://www.linuxmint.com/download.php. 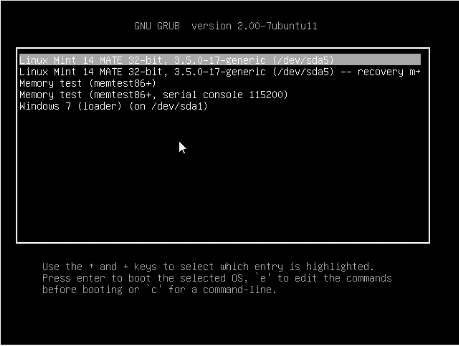 When your computer reboots the Grub boot loader will load and you will have the option to select which operating system you want to boot into. You can select Windows to boot into your Windows environment or select Linux Mint 14 to boot into your new Linux environment. Congratulations you have successfully installed Linux Mint 14 MATE onto your computer alongside Windows. If you like this guide, be sure to like and share on the bar to the left. Also be sure to leave a comment below and let me know if you have any questions. Enjoy.